No corner back-up studs for fully insulated outside corners. Corner-back eliminates back-up framing members. *Ref. U.S. Dept. H.U.D. Office of Policy Dev. 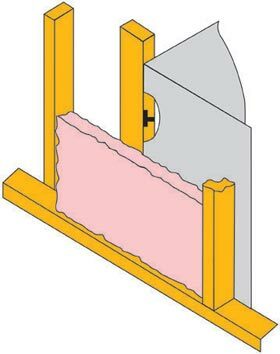 Corner-back fasteners let you locate partition members without the need for back-up studs. Drywall panels anchor securely to the structural studs. As a result, you create straighter corners. Mid-high blocking is not needed. 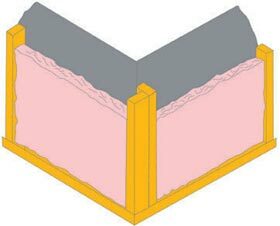 With Corner-back fasteners, it is no longer necessary to cut insulation for partitions abutting exterior walls. NOTE: Corner-backs reduce energy consumption by 2% per year in an average 2,000 square foot home, or as much as 16,800 BTUs per winter day. (Independent research report available; print-out coming soon). Corner-back fasteners easily accommodate prefabricated truss ceilings with their slight concave camber and tendency to uplift. Corner-backs are placed 16" apart along the gypsum board and then nailed to the top plate of the vertical wall. 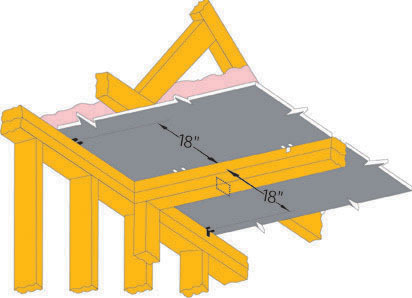 This allows the ceiling to easily follow the contour (up to 1 1/4") of the bottom truss surface.